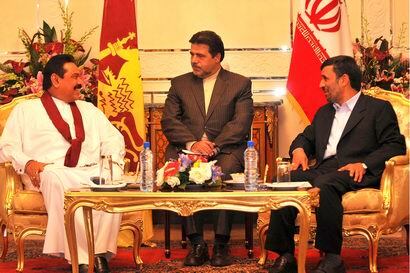 President Mahinda Rajapaksa held a series of talks with the Iranian leaders in Teheran on Sunday evening ahead of the G15 Summit which will convene on 17th May with the head of states from 18 countries. He was warmly welcomed by the President of the Islamic Republic of Iran, Dr Mahmoud Ahmadinejad at President Palace. Both leaders held a discussion to strengthen bilateral relations and agreed to boost mutual cooperation. Iran also pledged to make earnest efforts to ensure progress within the G15 as Sri Lanka assumes the group’s Presidency. President Ahmadinejad also extended his congratulations to the Sri Lankan President for receiving the Chairmanship of the 14th G15 Summit in Teheran. Presently it is chaired by Iranian President Mahmoud Ahamedinejad. The G15 was established 20 years ago from developing countries in Asia, Africa and Latin America to enhance the economic, political and multilateral trade activities among the members and also to provide input for other international groups. Minister of External Affairs Prof G.L.Peiris, Secretary to the President Lalith Weeratunga, Secretary of the Ministry of External Affairs Romesh Jayasinghe, newly elected MP Sajin Vas Gunawardena and Sri Lanka’s Ambassador to Iran M.M.Zuhair were present. is 9(1+8=9).He is the new head of G-15.The occult number of G-15 is 18 that adds up to 9.See,G-15 has 18 members. occult number of SRI LANKA is 18. The lankan army eliminated LTTE on May 18. At that time Rajapaksa was 63 years old(6+3=9).